Update: The launch of BepiColombo has been delayed by one day and is now scheduled for Friday, Oct. 19 at 9:45 p.m. (0145 GMT on Oct. 20). The next mission to Mercury has a scheduled start date. 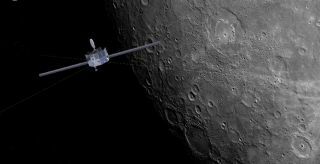 Liftoff of Europe's and Japan's BepiColombo mission is scheduled for a mid-October launch at earliest ), the European Space Agency (ESA) stated. The mission will launch aboard an Ariane 5 rocket from Kourou, French Guiana no earlier than Oct. 18 at 9:45 p.m. EDT (0145 on Oct. 19 GMT). On board will be two spacecraft that will travel to Mercury together: ESA's Mercury Planetary Orbiter and the Japanese Aerospace Exploration Agency (JAXA)'s Mercury Magnetospheric Orbiter. In a statement, ESA cautioned that the date is subject to change due to last-minute testing of the spacecraft in Kourou, and that the launch window extends until Nov. 29 if needed. "We have had a great start to our launch campaign in Kourou and are on track for launch in less than 90 days," ESA's BepiColombo project manager Ulrich Reininghaus said in a statement. "We have an incredibly packed schedule, but it is great to see our spacecraft building up together for the final time." The spacecraft will make their first Mercury flyby in 2022, three years after launching. When they reach their final orbits, the spacecraft will measure Mercury's interior, environment and interactions with the stream of charged particles from the sun called the solar wind, ESA officials said. "A number of scientific instruments will be active during the planetary flybys, with the transfer module's 'webcams' offering the potential to capture simple images before the main science camera is operational in Mercury orbit," agency officials added. The spacecraft will perform multiple flybys of Earth, Venus and Mercury between 2020 and 2025, before settling into their final orbits at Mercury in December 2025. The nominal mission ends in 2027, but it could be extended for at least one more year, officials said in the statement. The last mission at Mercury was NASA's MESSENGER (MErcury Surface, Space ENvironment, GEochemistry and Ranging) spacecraft, which orbited the planet between 2011 and 2015. Among other findings, that mission spotted zones where water ice could lurkg, shielded from the sun in permanently shadowed craters.